In a newly published study, researchers show how Down syndrome and low SNX27 are connected, discovering that the extra chromosome inherited in Down syndrome impairs learning and memory because it leads to low levels of SNX27 protein in the brain. What is it about the extra chromosome inherited in Down syndrome—chromosome 21—that alters brain and body development? Researchers have new evidence that points to a protein called sorting nexin 27, or SNX27. SNX27 production is inhibited by a molecule encoded on chromosome 21. The study, published March 24 in Nature Medicine, shows that SNX27 is reduced in human Down syndrome brains. The extra copy of chromosome 21 means a person with Down syndrome produces less SNX27 protein, which in turn disrupts brain function. 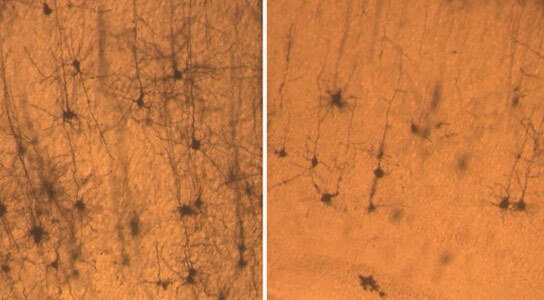 What’s more, the researchers showed that restoring SNX27 in Down syndrome mice improves cognitive function and behavior. Then the team got thinking about Down syndrome. The SNX27-deficient mice shared some characteristics with Down syndrome, so they took a look at human brains with the condition. This confirmed the clinical significance of their laboratory findings—humans with Down syndrome have significantly lower levels of SNX27. Next, Xu and colleagues wondered how Down syndrome and low SNX27 are connected—could the extra chromosome 21 encode something that affects SNX27 levels? They suspected microRNAs, small pieces of genetic material that don’t code for protein, but instead influence the production of other genes. It turns out that chromosome 21 encodes one particular microRNA called miR-155. In human Down syndrome brains, the increase in miR-155 levels correlates almost perfectly with the decrease in SNX27. Be the first to comment on "How Down Syndrome and Low SNX27 Are Connected"